Yesterday I was writing about the bombings in Boston; last night on the way home I heard about the huge explosion of a fertilizer factory in Texas. The explosion was so huge it registered at around 2 on the Richter scale. There have been fatalities, but as I write this the details are unclear, so I won’t add to whatever speculation is circulating. However, it’s obvious to everyone that there are truly explosive energies at play right now, so the first thing I’d like to say is that we all need to slow down, avoid being triggered, exercise caution (I’ll repeat this for the Mars/Aries rockheads in the group: EXERCISE CAUTION.) Avoid, avoid, avoid, road ragers, hotheads, and anyone who seems extremely angry or aggressive. This morning major roads near us were completely closed due to a bad accident on the highways. I heard a report of a car with the top sheared off. As we near the Eclipse Zone and the exact square of Uranus and Pluto, things in general will intensify and we’re all going to get the short course in crisis management, whether we like it or not. First key to crisis management is to be aware and alert in order to sidestep dangerous situations in the first place. Today the day begins with the Moon in Cancer, which squares Mars in Aries at 8:16 AM EDT. At 8:31 AM EDT, we’re in the 1st Quarter Square phase, where things reach “crisis point” or come to a head. This isn’t the most peaceful way to begin the day—we’re rocketed into the fray from the moment we open our eyes. Moon in Cancer square Mars in Aries can be a hair-trigger aspect , making people cranky and irritable. Then we zip into the Sun/Moon square, so there’s a double-Moon-whammy-Aries-Cancer effect, especially since we’re dealing with the last degrees of the signs. Whatever’s been avoided may all come to a head now, making it hard to remain objective. People may be over-stimulated and feel they need to “get it all out of their system” at once, which can be startling (not to mention unsettling). Use this swirling, raging energy to get things done. Attack your chores or to-do list with a fury and you’ll be surprised at what you can accomplish. Resist the temptation to take out any frustration on those those close to you. The Moon the moves to a short Void-of-Course period that lasts until it enters Leo (from 8:31 AM EDT to 11:13 AM EDT); lie low during this period and attend to things that have no emotional charge and you’ll be fine. The Moon enters regal Leo at 11:13 AM, which adds more fire energy to today’s mix and helps stabilize things a little (Leo is a fixed sign). The Moon squares Venus in Taurus at 8:16 PM EDT, so try and remember there are other people in the universe, and they need attention and love as much as you do! Key word for today: APPRECIATION. Be sure to let people know how much you appreciate what they do for you and how much you care about them. This is emphasized by the Moon/Neptune inconjunct and the Venus/Neptune sextile later this evening. Leo rules the heart, the Moon is our soul and feelings, Venus relates to love and value/s, and Neptune = universal love. Open your heart tonight. Spend time with those you love and see on a daily basis; send love to those at a distance or to heal difficult world conditions. Avoid “martyrizing” and escapist behavior. If you’re burned out from today’s conflagrations, indulge yourself a little tonight with whatever tickles your fancy (but since Neptune is involved, don’t go overboard)! The Kozminsky Symbol immediately reminded me of last night’s explosive fire at the fertilizer plant in Texas. The fire was so intense that no one has been able yet to get into the immediate area to assess the situation properly. It’s so powerful that, like a forest fire out of control, all our efforts to suppress it make little impression. Kozminsky points out that this shows one who “underestimates the strength of his adversaries” or is up against overpowering forces. One of the reasons to be cautious today is because of the strength of the current and approaching energies. Kozminsky also notes that the person represented is apt to “provoke argument without being prepared to meet it. Hence he is continually at the mercy of forces into whose grip he enters without regard to consequences.” It’s not a wise idea right now to start fights or get yourself involved in dangerous or risky situations, particularly when you’re not prepared or can’t handle the ramifications. It’s all too easy for things to escalate out of control. The Sabian Symbol is about having “all your ducks in a row” and seems to be the exact opposite of the Kozminsky Symbol. There’s enough water here for the duck family to float on, and all is serene. The little brood stays together happily, nothing eventful happens; the waters are calm. This Symbol suggests routine, things being the same every day, and going about your life in an unruffled and unhurried fashion. The down side is that over-reliance on routine and maintaining the status quo may leave us unequipped to handle change (like the man in the Kozminsky Symbol, we’re just not ready). 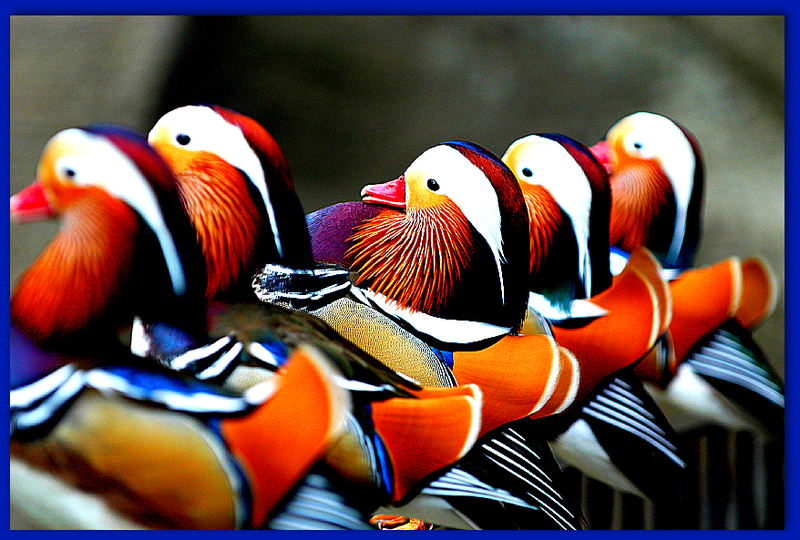 Since ducks travel in groups in a particular pattern, if the pattern is altered, there’s something going on. Pay particular attention to anything that’s “out of sync” as it may provide a clue to upcoming disturbances in the field. We may have to venture out of our comfort zone now in order to react to emergencies or deal with major change. Like the ducks, we may have been “imprinted” in a certain way, but it’s now time to release some of these early survival techniques and learn new ways to navigate through the waters. “Shelter from the Storm”. These cards mirror the two Symbols for today (see above). The 5 of Pentacles gives a feeling of being overmatched and underprepared. The storm is too powerful and we can’t find shelter. There may be a profound sense of loss and a lack of security. Both cards relate to value and worth. It’s time to take a look at the ways we’ve lost faith in ourselves and worked against our own interests. We may be holding on to the wrong values. The Empress tells us it’s time to reconnect with the basics in the face of challenges and loss. Love, empathy, and a connection with the earth on a deep level are important in times when people are “ in their heads” and out of their minds. If you lost everything, what would be left? What do you value most? What are you worth to yourself? What connections are sacred for you? How do we “get back to the garden”?